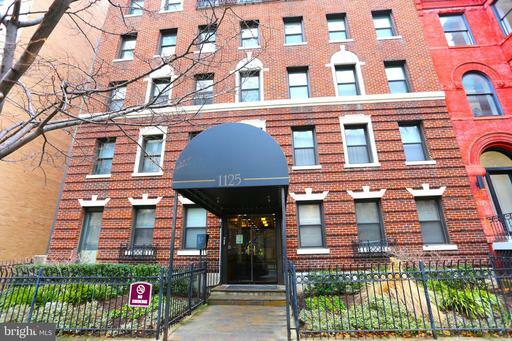 Sunny and Spacious 1 Bedroom Pied a Terre in the heart of DC-Close to 12th street and super Hip Logan Circle. Full Kitchen with a Granite Bar, beautiful cabinets and in unit washer/dryer combo. Beautiful, hardwood floors, freshly painted with Tons of Light and Windows. Bedroom has gorgeous French doors and a closet. Extra storage unit in hallway.Nice bathroom with granite floors, upgraded vanity and towel racks.Easy to Rent-Great for Investors. Pet friendly bldg. Condo fee includes all utilities. Secure building w/ elevator. Walkable to Metro, circulator buses, Whole Foods, dining retail on 14th, Chinatown, City Center, Strayer University, Convention Center more. Listing Broker: Abaris Realty, Inc.